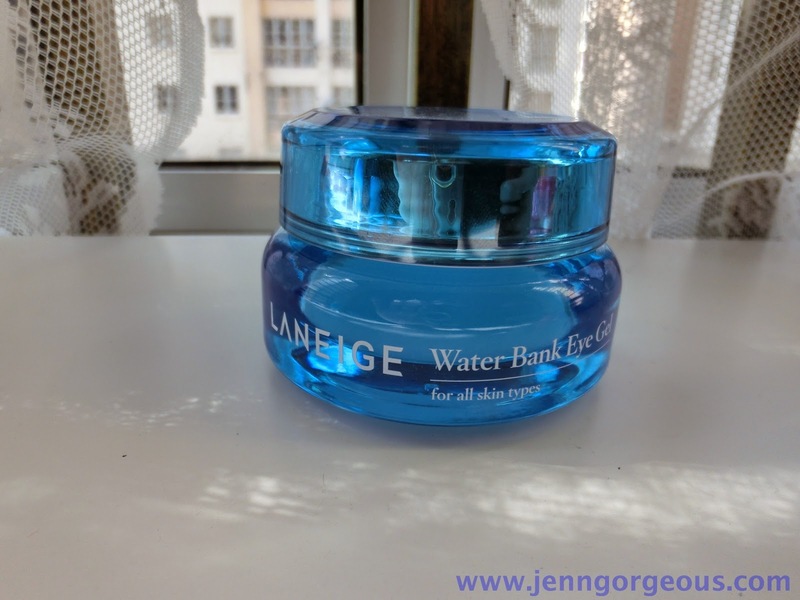 Any Laneige skincare lover? A lot of you might already know this brand, it's from Korea, and the ambassador is the famous beautiful actress Song Hye Kyo. I've know this brand about 8 years ago, when i was travelling to Korea, I bought their compact powder which has the unique packaging. I really love it and I still keep the packaging. Laneige means 'snow' in french, and the name explain everything that their product is to let your skin as beautiful like snow, white, radiance and beautiful. Their product comes in skincare and makeup. They are very famous with their hydrating skincare range. 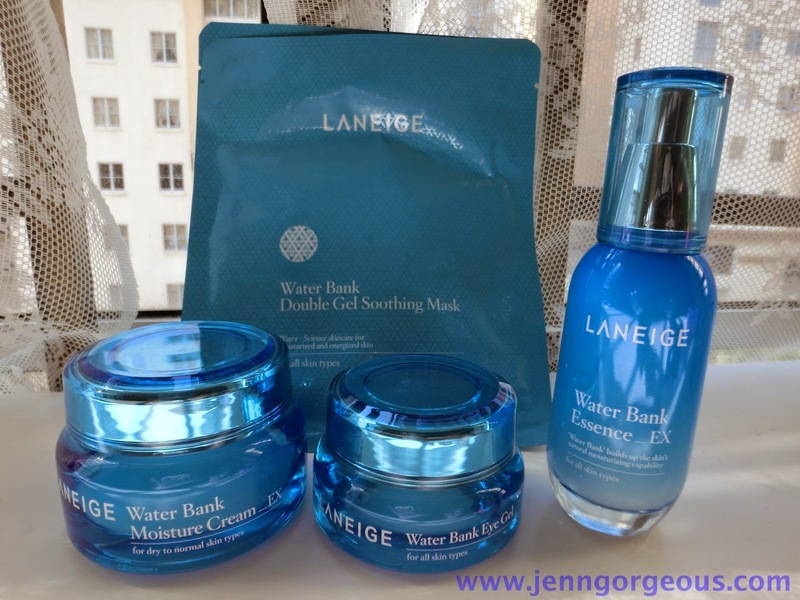 So today, I'm going to talk about the Laneige New improve Water bank product range. 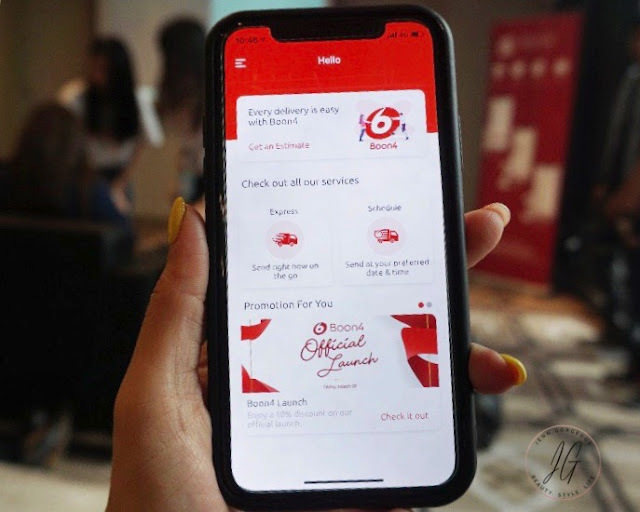 If you are looking for a skin dryness solution, you might wanna continue reading this blogpost. 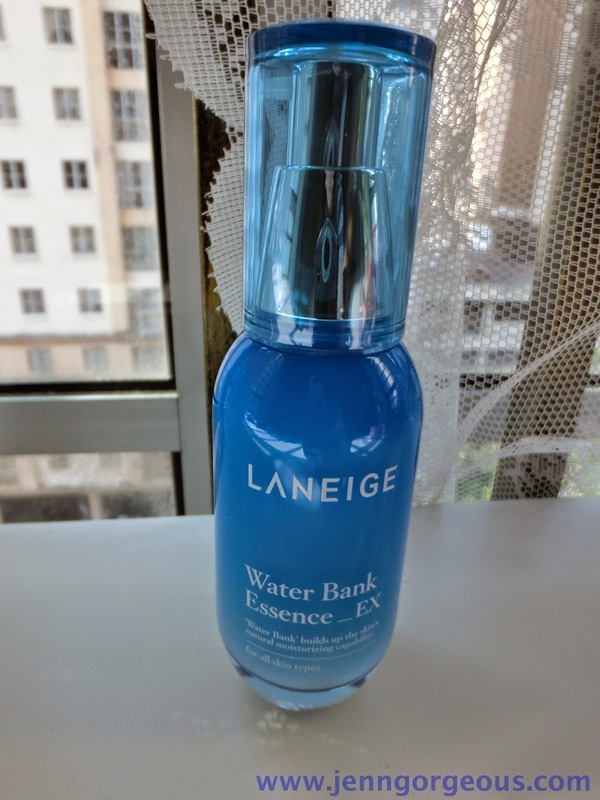 According to Laneige, Asian women tends to have naturally weaker skin barrier, which gets more easily damaged upon external stimulation, hence making it highly prone to moisture loss. So we always have that dryness problem, and dullness, aging, a lot of problem will come along. 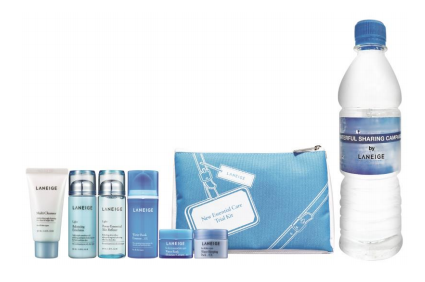 Therefore Laneige come out with their new improve water bank products that customised for Asian women skin. 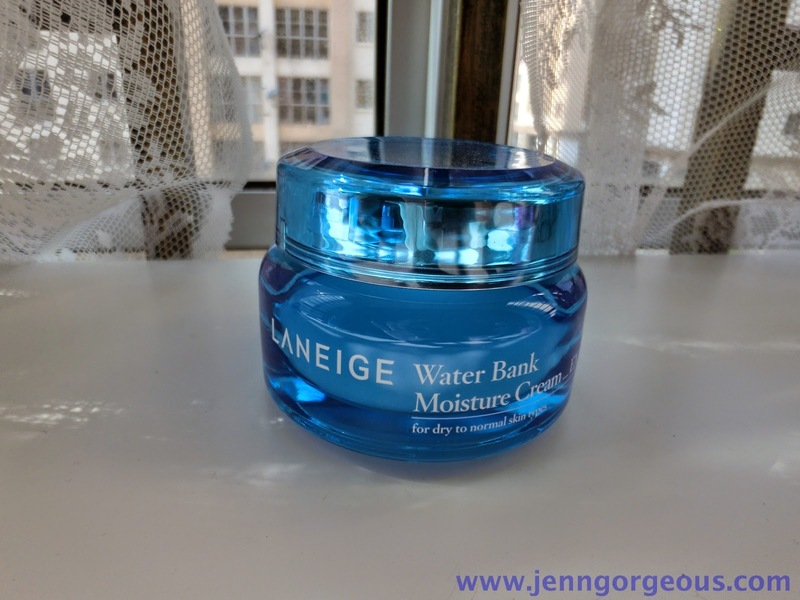 Laneige has upgraded their water bank range to focus on Asian women's skin, they taking consideration of our climate patterns and heavy use of air-conditioning. With their innovative formula of Hydro Ion Mineral water and the new Biogene Technology, it can actually promote skin to self-create of moisture even in dry condition. What's so special about the New Water Bank range? They are using Hydro Ion Mineral water in the new water bank range that give 8 times more effective in delivering moisture to skin as to compare with the Optimal mineral water, which is previously used int he previous water bank range. Hydro Ion Mineral is ionized water containing minerals and vitamins, its minuscule size enables the minerals to penetrate through 20 layers of skin, so that it can activates the moisturization genes. The New Biogene Technology™ effectively controls the skin's water oil balance. How it works basically is to activate the 4 genes (Filaggrin, SASPase, Caspase-14, Locorin) that are involved in creation of Natural Moisturising factors and the normalisation of epidermal cell division which is important for building up a healthy skin barrier. So it can maintain the moisture balance at an optimum level and strengthening the skin barrier to prevent moisture loss. Moisture cream, eye gel , essence , and soothing mask. This claim to replenishes moisture, eliminates puffiness. It contain Bilberry, which is a medicinal plant used to treat eyes since the 16 century in Europe, stimulates capillary vessel bloog circulation while helping to prevent eye dryness. This is a moisturiser that can claim to retain moisture for long hours. Upon application, it leaves a soft moisture film that helps to give elasticity to the skin. One of the key ingredients - Squalane, extracted from olives. It has micro-sized oil particles, which allow for a fast absorption, help to retain moisture for 24 hours and also smoothen the skin texture by reinforcing the lipid barrier in the epidermis. This contain Hydro Ion Mineral Water that can penetrates the essence deeply in 20 layers of skin, thus activating the moisturising gene which relieves dry skin and repairs skin damage. The key ingredients consist of Tilandsia Extract,w which is an air plant that absorbs moisture from the air, while optimising skin moisture balance as a result f the presence of the Natural Moisturization Factor Betaine. This essence also contains white willow bark ext rat, it can reduce skin heat in order to lessen the escape of moisture from the skin. It claims to improve overall skin texture. This mask is perfectly designed to fit all the curved lines of the face, leaving no gasp in order to evenly deliver activating ingredient to all parts of the face. It contain Green tea extracts, rich in catechin to supplies nutrients to the skin to prevent aging and vitamin C to helps to keep skin well moisturised. Beside that, Tannin is an ingredient to help with sebum control. It also very soothing to use because of the Chamomile ingredient. I will write review for these products soon, so stay tuned on my blog. And if you are interested on these new product but you don't want to get their full sized? You can buy their "Waterful Charity kit" for Rm129 and Rm10 from the charity kit will be contributed towards the " waterful sharing campaign". This campaign is to raise awareness on water accessibility to communities in need. They targeting to raise Rm60,000 through a 3month campaign to facilitate the installation of rainwater harvesting system in selected homes. Currently three homes is beneficial from the campaign, including Trinity Community Children Home society, Shelter Home for children and Praise Emmanuel Children Home. So let's support this campaign together through buying their "Waterful Charity kit". Very good kit to start your journey for a younger and hydrated looking skin.